Missouri metal titans CONQUEST have decided to make a track from their current Under The Influence album available for a free download until this coming Monday, 20 June. The track in question is their mind numbing cover of BLACK SABBATH's classic "Children Of The Grave". The song's inclusion on Under The Influence was described by frontman Derrick Brumley: "These guys started it all. When I was 7 or 8 my brother's girlfriend brought over their first album and I was completely blown away! She ended up leaving it at our house and it became mine. "Children .." is the one song that has stuck with me over the years." Under The Influence is CONQUEST's tenth album overall and third for Dark Star Records. 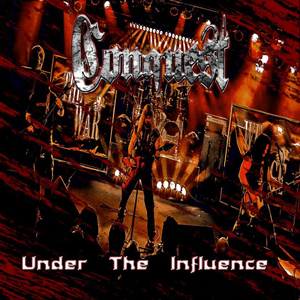 After nine albums of original music, the idea for Under The Influence was launched back in 2014 when CONQUEST began doing additional sets at their shows, calling them the "Tribute To The Metal Gods" segment. They'd cover material from IRON MAIDEN, PANTERA, METALLICA and SLAYER during this portion of the show and it got such an overwhelming response that the band decided to expand the idea into a full fledged tribute album, championing those artists as well as MOTLEY CRUE, UFO, MOTORHEAD, JUDAS PRIEST, ANTHRAX and even BON JOVI. BON JOVI? "Of course BON JOVI," states Brumley. ""Wanted:Dead Or Alive" is a classic song - who wouldn't want to hear a metalized version of it?!" CONQUEST's cover of "Children Of The Grave" can be downloaded below by simply clicking in the upper right hand corner of the Soundcloud box.